The PF-40 Suction Feed Automated Folder combines high-volume suction feed capabilities with the intelligent automation that Horizon products are so well known for. The 1,000 sheet capacity top-fed system is quick and easy to set up, all the user has to do is simply select the sheet size and fold pattern and each section sets-up automatically. The PF-40’s push-button control panel enables any user to set-up for the six most popular fold patterns of standard cut-sheet sizes and can store up to 10 jobs in the memory for instant recall; which is especially useful for repeat and complicated jobs. The crisp tight fold quality is ensured with high grip rubber fold rollers, these roller gaps can be adjusted with a simple dial to fold thinner to thicker sheets. The paper size range for the PF-40 is from 5″ x 5″ to 12.5″ x 18.5″ and up to 1,100 sheets of paper without requiring pre-scoring or creasing. The PF-40 features a built in registration guide table which keeps sheets correctly registered at its highest operating speed of 390 sheets per minute. 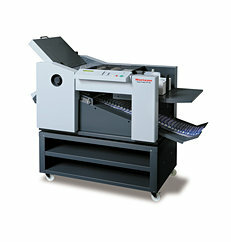 The rolling MT-40 base cabinet is included with the PF-40, and this folder. The PF-40 is easy to maintain with its unique maintenance feature for sheet jam removal and roller cleaning. If you have any questions or are interested in purchasing the PF-40 Suction Feed Automated Folder, visit us at SpiralBinding.com. We have great pricing on a full line of Air Feed Paper Folders. Call us at 1-800-631-3572 for more information!